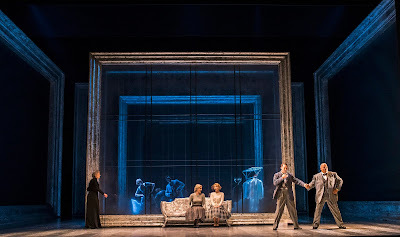 Having been performed in concert, by students and on the fringe, Samuel Barber's 1958 opera Vanessa (with a libretto by Gian Carlo Menotti) finally made it to the main-stage of a UK opera house with Glyndebourne's stylish new production which opened on Sunday 5 August 2018. Directed by Keith Warner in designs by Ashley Martin-Davis with lighting by Mark Jonathan, movement by Michael Barry and projections by Alex Uragallo, the production featured Emma Bell as Vanessa, Virginie Verrez as Erika, Edgaras Montvidas as Anatol, Rosalind Plowright as the Old Baroness, Donnie Ray Albert as the Old Doctor, William Thomas as Nicholas, the Major-Domo, and Romanas Kudriasovas as the Footman. 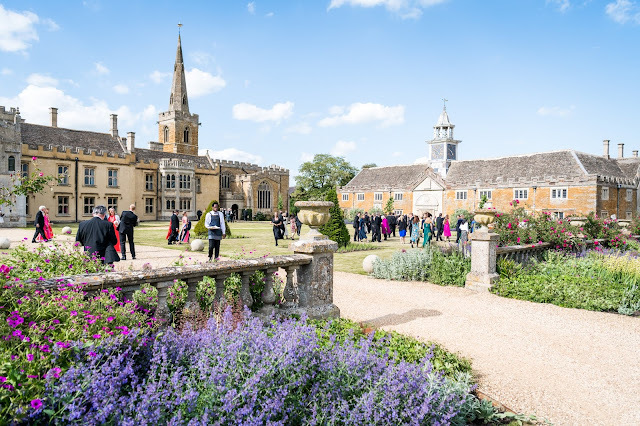 Jakub Hrůša conducted the London Philharmonic Orchestra and the Glyndebourne Chorus (chorus master Nicholas Jenkins). Vanessa seems to be having something of a moment, in 2016 there were productions at Santa Fe Opera (directed by James Robinson, conducted by Leonard Slatkin with Erin Wall, see my review) and at the Wexford Festival (directed by Rodula Gaitanou, conducted by Timothy Myers with Claire Rutter, see the review on Bachtrack) and now Glyndebourne. Menotti's libretto leaves a great deal unsaid, and each production took a different view. 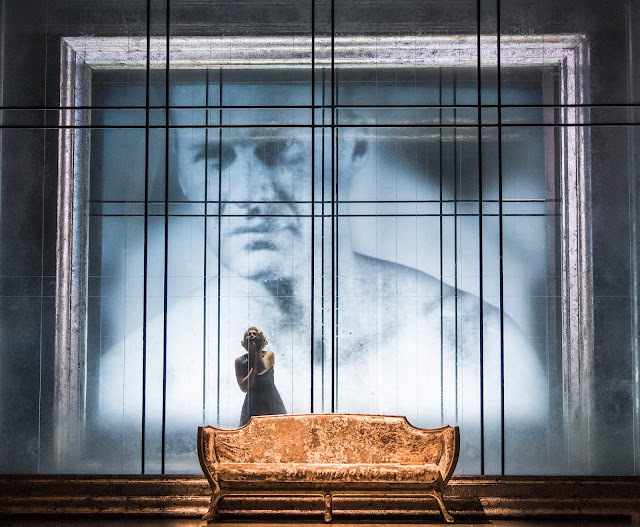 At Santa Fe, staged handsomely as Hollywood noir, the production did not dig very deep, whereas at Wexford the production brought out the Chekov-like overtones of the plot. 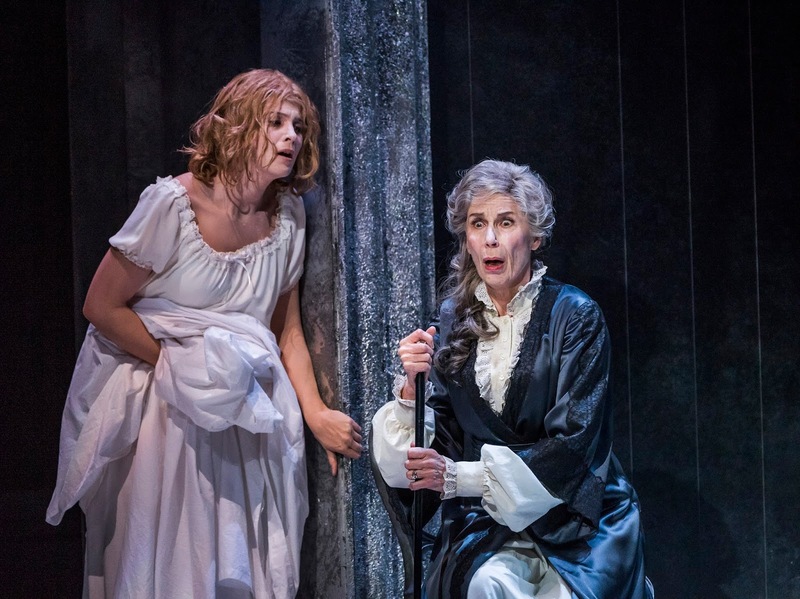 At Glyndebourne, director Keith Warner has been doing a close reading of the libretto and teasing out hints of facts left unsaid, bringing a more concrete element to the darkness surrounding the characters and hinting at explanatory back stories. Visually, there was more than a hint of Alfred Hitchcock in the production (Vanessa debuted the same year as Hitchcock's Vertigo), but the protagonists of Vanessa are far more active, far more self-aware than many of Hitchcock's heroines. Mirrors are something a theme of the libretto, and Ashley Martin-Davis' set used these as the main theme, with huge frames which sometimes reflected and sometimes were transparent. Through these mirrors we could see action in other parts of the house, but also we could see the past as people remembered. The result was to create fascinating multi-layered visual imagery, so it was possible for Anatol and Erika to duet, yet still have Vanessa as a ghostly presence on stage. The period was loosely the 1950s (the period of composition rather than the original setting of 1905), but Martin-Davis' costumes were relatively non-specific with stylistic of the 1930s too as if the household really was preserved in aspic. 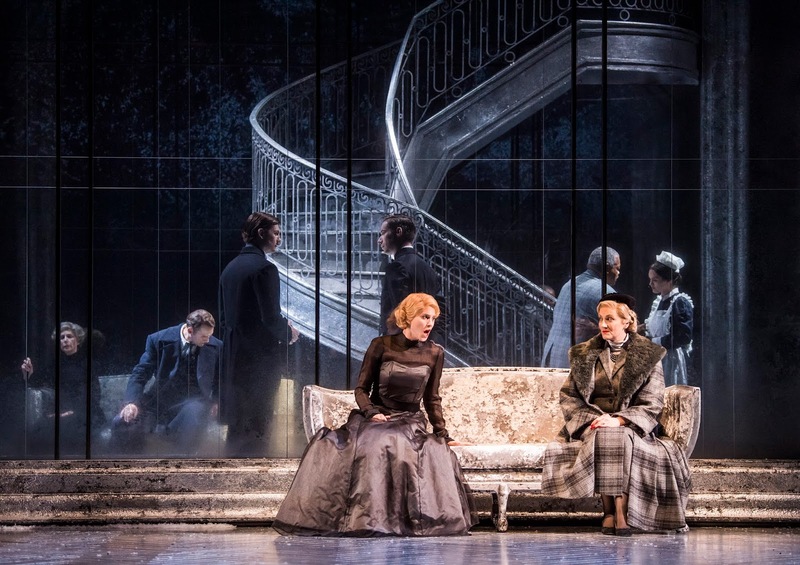 By suggesting that Anatol is Vanessa's son, that the younger Vanessa and the Doctor had a flirtation separated by anti-miscegenation, and that Erika has an abortion, Warner provides a concrete backdrop to the torrent of emotions in the opera. 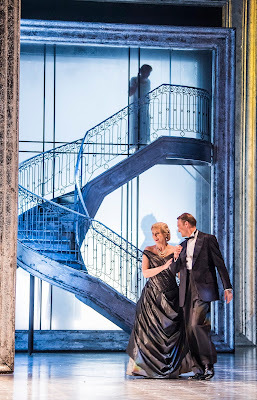 It does not quite solve the opera's problems, the title role is still something of a mystery and everything remains somewhat overheated, but these suggested back stories give a remarkable complexity and depth to the resulting drama. 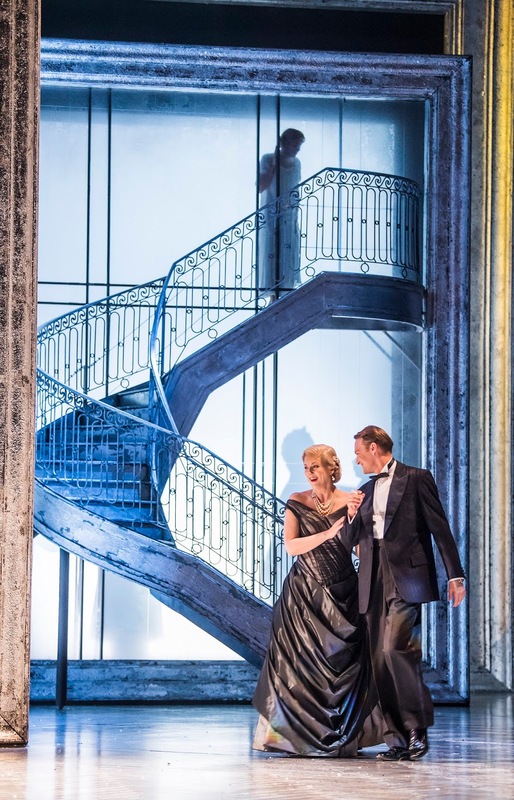 It helped that in Glyndebourne's five principals, we heard performances of real stature. In the title role, Emma Bell displayed the benefit of having a real jugend-dramatisch soprano rather than a lyric soprano in the title role. Bell soared over the role's challenging moments with much to spare, allowing her to dig deep into the character's complexities and she combined this with the gorgeousness of vocal texture that the role needs. Bell brought out the needy, nervous side of the character making her delusional behaviour seem self-absorption as she floats through most of the action unaware that her niece is in love with the same man. 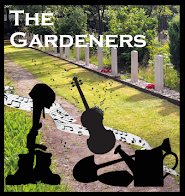 Bell's was an enormously sympathetic performance, and one which gripped particularly in moments like her great solo 'Do not utter a word', given a very intimate, concentrated account. Perhaps, Erika is the larger and more significant role. Arguably she is the character who develops and changes. We saw Virginie Verrez as Erika in Santa Fe in 2016, and here she seemed to have developed her performance, creating an Erika who was burningly passionate yet intensely conflicted. Her account of Erika's refusal of Anatol's offer of marriage was powerfully projected, capturing the character's inner troubles. During this sequence, at the end of Act One, and when Erika rushes out into the snow at the end of Act Two, Warner's use of film created a visual metaphor for what was going on inside Erika's mind. Verrez sang the role with focussed intensity, and rightly made Erika the centre of attention, even when simply sitting rigidly still. Edgaras Montvidas was a casual charmer of an Anatol, very much the chancer who plays both Aunt and Niece to see which comes off better. Like Nicolai Gedda (the first Anatol), Montvidas does not have a conventionally romantic voice, he combines intelligence with a fine technique and a chameleon-like ability to create character with his voice. 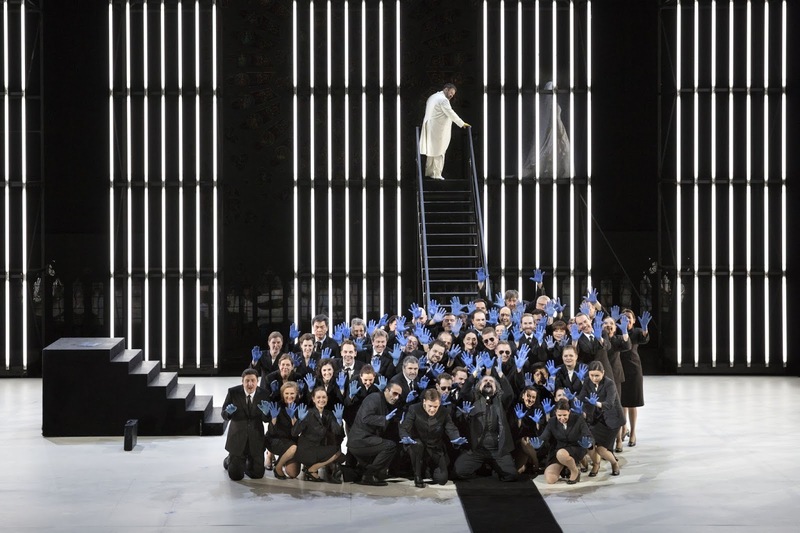 The opera never quite gives us the chance to see what makes Anatol tick, and Montvidas suggested the way Anatol could respond to each person differently. 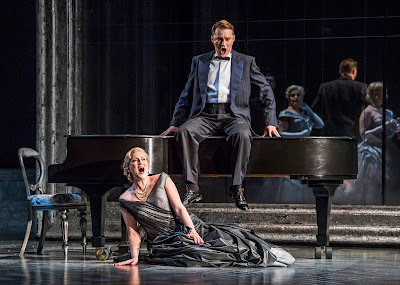 Having said Montvidas' voice is not conventionally romantic, I have to make clear that it opened up with real intensity in the Act Two duet with Emma Bell's Vanessa, even which Montvidas' body language suggested a degree of disengagement, again Anatol giving Vanessa just what she wants. Donnie Ray Albert was a wonderfully sympathetic Doctor, his fascinating relationship with Emma Bell's Vanessa in the present coloured by what we see of their relationship in the past and the knowledge of the problems this might cause. Albert tactfully suggested the layers, under the bluff exterior. The smaller roles were well played, with William Thomas a a striking Major Domo and Romanas Kudriasovas as the Footman. 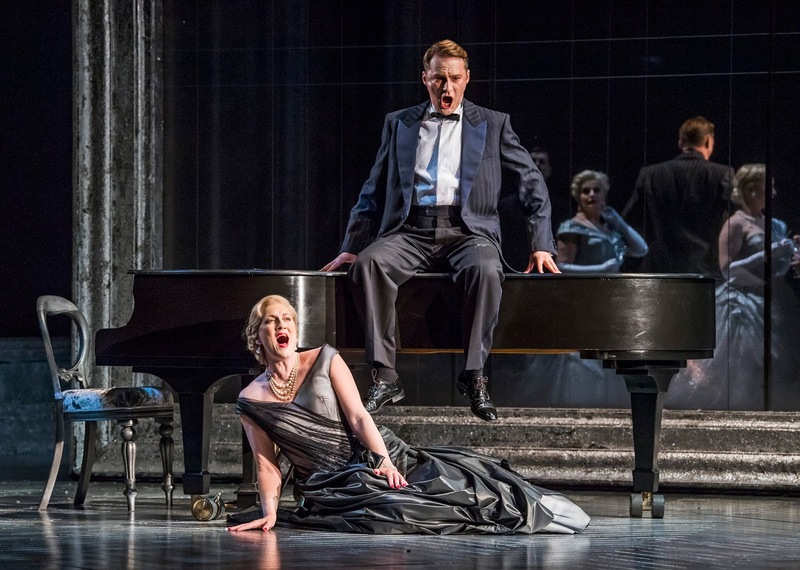 The chorus has a small role, here expanded to create a suggestively disturbingly element in Act Two via Michael Barry's choreography. The standard of English diction was very high, so that one could forget about the surtitles for whole sections and simply concentrate on the stage picture. A great testament to a cast which included two non-native English speakers. Jakub Hrůša and the London Philharmonic Orchestra made Barber's richly passionate and complex score an extra character in the action. 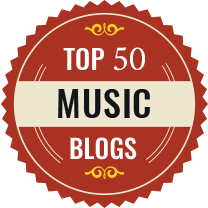 Hrusa played Barber's music for all it was worth, never neglecting the lush romanticism but also bringing in a surprisingly complex depth to it and some moments of real anger. Barber's Vanessa is unlikely to become a repertory piece, it requires too careful casting for that, but this production showed that it can be a far more richly rewarding and complex experience than its reputation as the last great romantic opera suggests, and Glyndebourne's finely balanced quintet of solosts are definitely worth catching in this passionate performance where Keith Warner's production turned the opera into a piece of gripping psychodrama.